The service process starts far before the machine is delivered to our showroom. The first inspection may be a short viewing, but should we have interest for our stock or for a customer´s use, the machine will be thoroughly checked by engineers in the factory. This entails a careful examination of all machine-parts´ functions i.e. slides, motors, spindles, bearings etc. Accuracy checks with 0.001 mm guages for "small" machines and laser measurements in case of large machines are standard practice for us. As we buy only machines which pass our rigorous standards and are in excellent conditions, D´Cunha has become synonymous for the highest quality and accuracy. We also undertake complete factory buyouts (NO GIBBERISH, ASK FOR REFERENCES !!) so there are EXCEPTIONS to our high quality rule. WE WILL INFORM YOU ABOUT THESE BEFORE YOU PURCHASE THEM FROM US AND NOT AFTERWARDS. Mitsubishi Double Column Vertical machining centre Model M-VB16A 1989 with a Fanuc OM-C control X 2200 mm, Y 1600 mm, Z 950 mm. 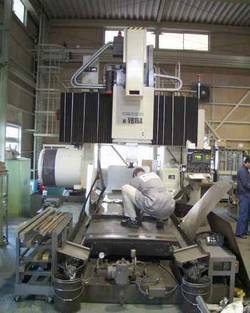 Bought by us in 1997 for the showroom/stock The machine was situated in a village 85 kilometers from Osaka, Japan. The picture shows the removal of the slideway covers in X. After this, we performed ball-bar tests with the Renishaw ball bar equipment to prove the axes. The machine was in beautiful condition, came to Celle, and was sold to a high technology producer of dies, where it still works today. Dismantling and Cleaning The main machine parts are exposed for rigorous inspection, cleaning, repair or replacement. That the old oil is drained, slideway scrapers replaced, seals replaced etc. hardly deems worth mentioning. When the machine has been fully checked, it is powered up and subjected to the same tests once more. Inspection It is no longer in our interests, as we have done in the past, to employ engineers who will need specific expertise, from sub-contracted technicians, for speciality tasks. Through the (partly prohibitively expensive) learning curve over the years, we have proven that, it is to our own as well as to our customers´ best interests, to employ the best engineers for the job in hand. After all, is this not the same philosophy that applies to the slogan: "Choose the right machine for the right job". We certainly choose the right engineers for the right jobs. Packing and Shipping We ensure that our machines are packed with extreme care to prevent possible damage during the transport. Years of experience do not make this a matter to be taken lightly. After Sales Service After sales technical support is once again provided by the best freelance engineers. Here, we spare no time, effort or finance in ensuring the smooth running of our customers´ equipment. Indeed, we very often purchase and supply spare parts to our customers worldwide, quicker than they can buy them from the agents in their countries.